I found a family campground that is wonderfully accessible and guess what it is right on the beach! Ocean Lakes Family Campground, a destination campground is just 6 miles south of Myrtle Beach. Named 1997,1999, 2002/03 National RV Park of the Year By. ARVC. And it definitely deserves these awards. Though Ocean Lakes is a very large busy park, with over 3300 sites, it still has a real community atmosphere. This I believe is accomplished by the attitude of staff, from the founders Nelson and Mary Emily Jackson to the teammates who run the many activities. Ocean Lakes is a Real family camp with kids everywhere of all ages having a marvelous time. Though with the 11pm curfew things settle down well. Ocean Lakes has it own security force, which keep a real eagle eye. Ocean Lakes features nearly one mile of soft sandy beach leading you right into the beautifully refreshing Atlantic Ocean. You can take in the entire view from the oceanfront Observation Deck. There is a convenient oceanfront Beach Concession right beside the oceanfront Observation Deck. Ocean Lake Family Campgrounds really works hard to make all guests comfortable. For those of us with special needs, Ocean Lakes has created a handicap accessible environment. Golf cars can be rented to assist those with special needs in traveling throughout the campground. If you, or someone in your family, needs assistance just tell any one of the teammates immediately and they will readily help you. What I found was most of Ocean Lakes amenities are on ground level, without stairs. For those of us who are physically challenged, the few buildings and structures that have stairs, also feature ramps. There are several beach accesses but one is especially good which has a small deck that you can overlook the beach. Use a wheelchair or scooter and want to enjoy the beach? The Recreation Office has beach wheel chairs equipped with large wheels to travel over sand. Now the swimming pools are just wonderful! There is a portable handicap lifts for the pools. The streets are paved for a smoother ride - all 29 miles throughout Ocean Lakes! Since I have limited mobility, I used the Golf Cart to get around nearly exclusively and they are great fun! 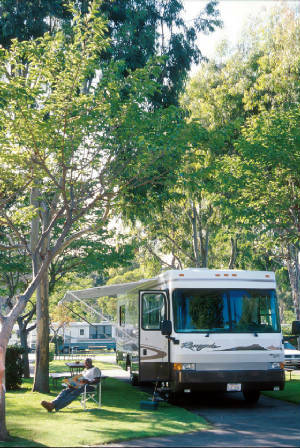 Ocean Lakes Family Campground features 893 campsites. All sites are pull through and generally accommodate a 40' campers (some sites are much larger) for slide outs on both sides. Tents are welcome on all sites as well. Sites include water, sewer, 20-30-50 amp electric, 70 channel cable TV hookup, a modem-friendly phone jack with free local calls, daily curbside trash pickup and a picnic table. Reservations are made up to 18 months in advance according to site availability and sites are reserved by specific site number. You don't need a camper to stay at Ocean Lakes! They have nearly 300 rental sites that range in all sizes and price ranges! Ocean Lakes Properties handles the reservations beginning in January every year. Beach houses and trailers available are individually owned and each site therefore has a unique personality. The rental sites are fully furnished, all you need to do is bring your linen and personal items. The hub of activities is the 17,000 square foot Recreation Center. Check out the Activities Calendar, and the racks of Myrtle Beach brochures. The Game Center located next to the Recreation Building in Sandy Harbor Family Fun Center. Great games for all ages. One of the many neat things that I really enjoyed at Ocean Lakes is the Nature Center Discovery Lab .It is a wonderful place for rainy days or to take a break from the beach or pool, All kinds of interesting things have been found right here on Ocean Lakes’ beachfront, from a 6" wide sharks’ tooth fossil, to a bison’s tooth fossil. With a mile of oceanfront and eight lakes, you will be able to find the perfect "fishing hole." You will find all you needs at the NEW 10,000 square foot Camptown Store, which includes groceries, snacks, ice, gifts, and souvenirs. Right next door to the camp store is the main snack bar. Where you will find great fast food and wonderful ice cream cones – I tried them and they are the best!! If you need anything for your RV that is covered at the onsite Ocean Lakes RV Center. Security is a priority at Ocean Lakes Family Campground. The 24-hour security patrols offers guests peace of mind around the clock. Due to the size of this oceanfront campground, an important aspect of customer service and operations is maintenance. Ocean Lakes employs a wide range of talented teammates from carpenters and electricians to plumbers and mechanics. Bulletin Boards - There are eight large bulletin boards located throughout the campground. L. P. Gas is available daily; the truck will come to your site. Church Services are held every Sunday and holidays. It is a non-denominational Christian service. Book Exchange Library is located in the Recreation Building. Playgrounds - Ocean Lakes continues to upgrade the playgrounds annually expanding and improving the equipment. The playgrounds are oceanfront. Bocce Ball Court - oceanfront. Ocean lakes is truly 5 star camping with its amnesties, facilities and the staff .It is certainly 5 stars in abilities and attitudes. If you want a real fun vacation with sun, surf and lots of family things to do then Ocean Lakes Family Campground is the place for you. I personally just love this place, not only was it so convenient for me to get around but the staff are second to none, everyone who works there seems to be having a great time and loving their jobs. The teammates set the tone and they have set the Right tone. From security to Lifeguards to Rec staff to café staff, everyone is happy and helpful. This is a big active campground, but yet you can just lay back and enjoy yourself too. A wonderful family spot is safe, fun, and friendly.